Cut the Cord, save money with The Boostwaves EasyAntenna 2805B. No Need for contracts or Monthly bills, Get free HDTV for $0/mo. Up to 150-mile range to access Over-the-Air TV channels without a cable or satellite subscription. 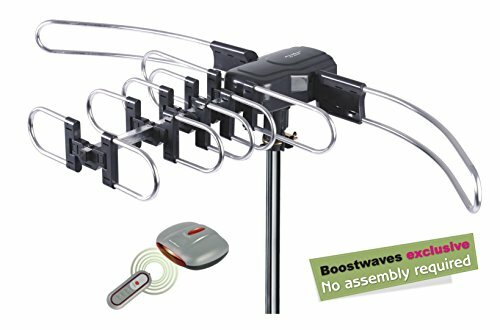 The Boostwaves EasyAntenna is the first outdoor antenna on the market that requires no assembly offered exclusively by BoostWaves. It maintains the robust design and superior quality while minimizing the hassle of assembly, the foldable design enables it be portable. Pack it up and take it on your next road trip. This Antenna comes with our PureVertex technology, meaning that signals from other appliances, cellular signals, FM signals get omitted. Leaving you with a crisp picture and more channels. Built in Noise Reducer, which cancels noise that can be generated from household appliances, power lines and other antennas around you. This allows you to get reception of signals with low levels enabling you to view more channels. Gone are the days where you have to get up on the roof and change the direction of the antenna yourself, you can do all of that by the comfort of your living room by the touch of a button. This Model includes a motor that enables you to rotate the antenna 360 degrees at a touch of a button. Built in Booster, giving you more channels with superior picture quality for FREE. Comes with 1 Year warranty.